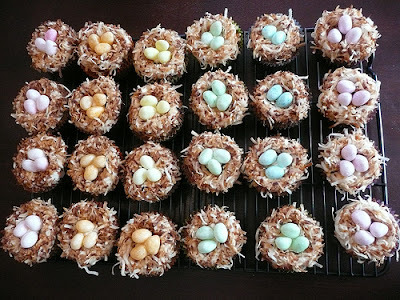 Are you looking for a sweet little dessert to serve this Spring...whether it be for Easter, a baby shower, or just for the sheer enjoyment of welcoming in the warm weather? 1.) 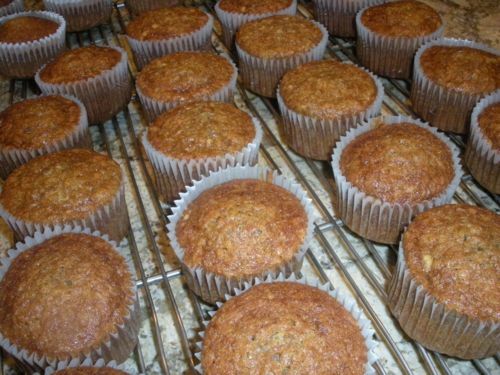 Allow your cupcakes to cool. 2.) 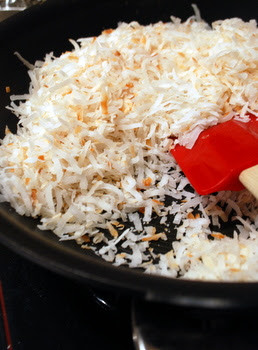 Toast the coconut flakes in a skillet over medium-low heat. 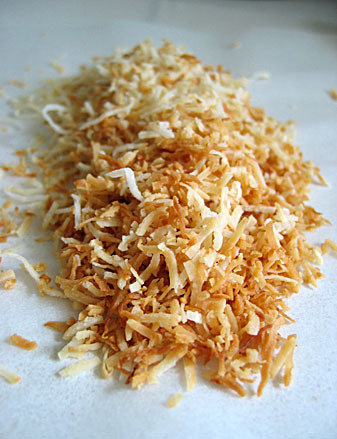 Stir often--coconut has a high fat content and will easily burn if you stop watching it. Remove from heat once all of the coconut is golden. Toasting the coconut that forms the nests adds a natural straw color as well as a pleasant crunch and nutty flavor to these whimsical cupcakes . . . 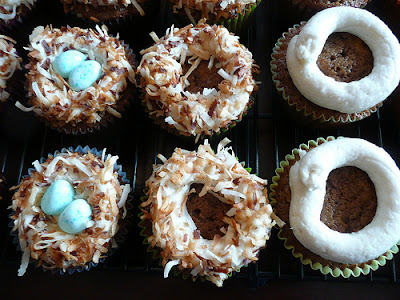 Working with a few cupcakes at a time, use your piping bag to top each cupcake with a ring of cream cheese frosting and pipe a big O on top of the cake. 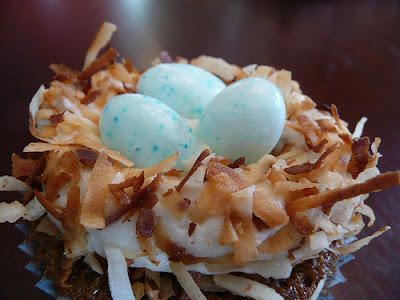 Turn the cupcake over and lightly smush each O into the skillet of toasted coconut, flattening it slightly. Sprinkle coconut liberally all over the sides of the O and shake off any extra that doesn't stick. Pipe a dot of frosting in the middle of the O and place Easter candy eggs in the center of each nest. 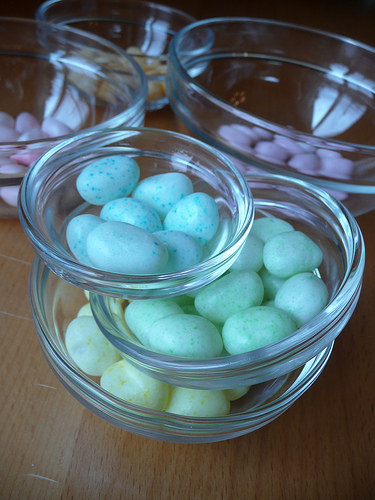 Easter egg candies come in many different sizes; use as many as will comfortably fit in each nest . . . The finished cupcakes can be refrigerated in an airtight container for up to 2 days; bring to room temperature before serving. Makes 12 cupcakes. Sift together the first 6 ingredients. In a large bowl, whisk the oil, brown sugar and eggs until well combined. Whisk in the applesauce, vanilla and carrots. Add the dry ingredients and mix until combined. Stir in 1/4 cup of the chopped walnuts. Cream together cream cheese and butter until homogenous and soft. Add vanilla and coconut and mix thoroughly. Beat in the powdered sugar a bit at a time until frosting is the right consistency, thick but spreadable and holds it shape. Right? 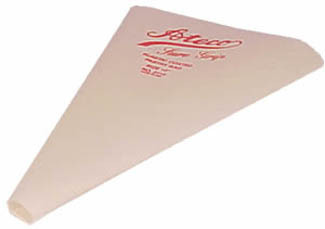 They look so much more difficult to make than they truly are! 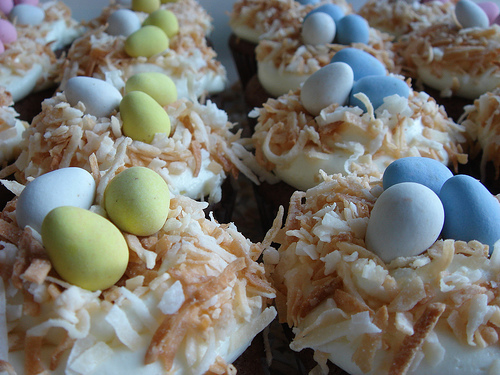 I bet you could do a german chocolate version as well...yum!